A networking event on services, care and benefits for parents of children with special needs will take place in Crown Heights. As your friends worry about their children’s teachers, after school clubs and social activities, parents of children with special needs have worries that extend way beyond these concerns. Parents of children with special needs are concerning themselves with constantly changing insurance policies, planning for the future, bills piling up for specialized toys and therapies; the list is endless. 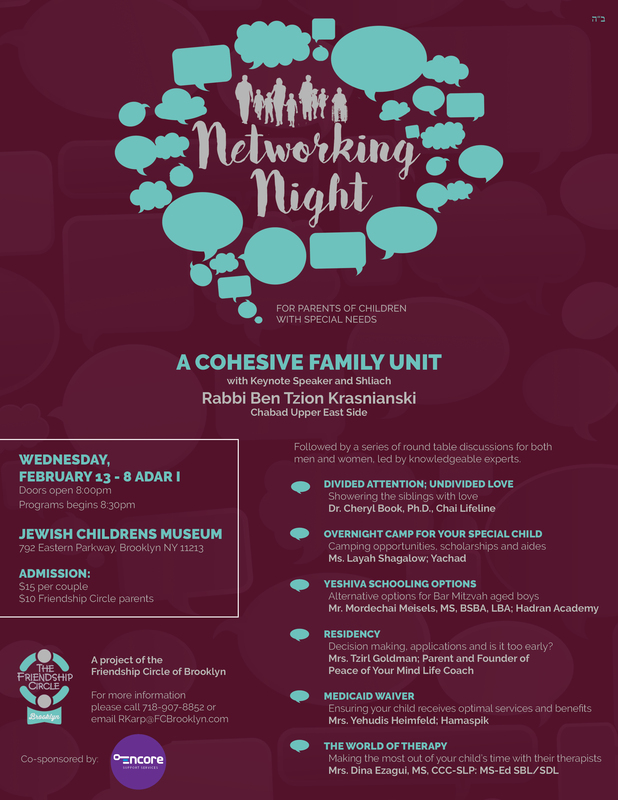 A unique evening planned by the Friendship Circle of Brooklyn, will be on Wednesday, February 13th (8 Adar I) at the Jewish Children’s Museum at 8:30pm. This event is open to ALL parents of children with special needs in Crown Heights. Parents will be addressed by keynote speaker, Rabbi Ben Tzion Krasnianski, after which they will have the opportunity to partake in a round table discussion of their choice. Drawing together experts from various fields, parents will have the opportunity to be educated on a range of topics, ensuring every single child is receiving optimal services, care and benefits. Parents will have the opportunity to learn tips and strategies on how to most efficiently operate as a family unit despite the unique challenges that are involved. They will have the opportunity to get information on how to navigate smoothly through the hardships that arise at different stages in the life of a child with special needs.